Over the weekend I preached a message in our SING! Christmas series where we are studying the first four Christmas carols from Luke Chapters 1 and 2. This weekend’s message was called Zechariah’s Song from Luke 1:67-80 which takes place under some unusual circumstances. Zechariah was a priest in the countryside of Judea. He was married to a woman named Elizabeth. They had tried for years to have a child but they were unable to have they what they so desperately wanted, a child to call their own. Even though they didn’t get what they so desperately wanted nevertheless they loved and served God faithfully never bringing into question the goodness of His heart toward them. Stop for a minute! Don’t you wish we could have that kind of testimony? They loved and served God despite their current situation. What they didn’t know is that they were going to be playing a huge part in fulfilling a promise God made to mankind hundreds of years even before they were born. They knew of the past. Zechariah was a priest he knew the Old Testament. He knew the good deeds of God. They could see the present. They knew what life looked like for them. However, they couldn’t see the future. They didn’t know that God was going to invite them to become a part of man’s salvation history. They were going to have a son who would be called the greatest prophet to ever live. They were going to be the parents the forerunner of the Messiah himself. Jesus’ personal ring announcer if you will, John the Baptist. The name John means, “God is gracious.” God had a plan for their lives. God has a plan for your life. Be encouraged! Now here is where the story gets a little squirrelly. The Angel Gabriel appears to Zechariah and tells him his prayers have been heard and answered he is going to be a Daddy! Sounds pretty awesome huh? Well Zechariah like so many of us opens mouth and inserts foot. He started looking at things in the natural versus the supernatural. He started trying to figure out the divine mystery of God and questioned how this could be since he was old. Now an Angel is standing before him telling him what is up and he is questioning the angel! Come on man. So God said, Hush yo mouth son! You won’t be able to speak until you see my promise come to pass then you will know. Shut up! So for nine months Zechariah served in the temple but could speak until the day finally arrived. It was time to give birth to his son. Elizabeth gave birth and they were trying to figure out a name. The family wanted another name, a name that was within the family. Remembering the Angel Elizabeth told them the boy is to be named John, God is gracious. After a struggle with Zechariah’s family. Zechariah’s mouth was opened his tongue was loosened and he said, NO! The boy’s name will be John! Zechariah’s broke out into praise and thanksgiving to God. He had a song in his heart for nine months. Can you imagine him watching his wife grow in her pregnancy longing to sing praises to God for His goodness? Can you imagine how hard it must have been not to utter songs of thanksgiving and praise for God’s exceeding goodness to he and his wife? Zechariah couldn’t hold it any longer! Here is his song! Read Luke 1:67-80. Zechariah’s Song wasn’t just about the miracle of having a son. It wasn’t just a song about God’s goodness to grace to he and Elizabeth. His song had a message for the world, “Salvation is Here!” You see just three months after the birth of John the Baptist would come the birth of Jesus Christ the Savior of the world. John would go on to prepare the way for Jesus’ public ministry, life, death, and resurrection from the dead defeating mankind’s three greatest enemies satan, sin, and death and offering us salvation and new life. Zechariah’s song was a song of salvation for all of mankind. Imagine how hard it was for Zechariah when a pregnant Mary visited pregnant Elizabeth and John lept in her belly full of the Holy Spirit. I imagine he longed to break forth into praise to the greatness of God and yet his tongue remained silent. He had a long time to think and pray over the lyrics. Ask yourself these questions. What are you waiting on God for? What has God promised you? What are you believing God for? Could you be a part of a Christmas miracle for somebody today? What dream is being conceived in your heart? I don’t know how long you’ve have been waiting. You know your past better than anyone. We have Bible as a testimony to the greatness and goodness of our God. You know your present better than anyone. No one knows what is happening inside your head and inside your heart in real time or the present better than you. You know your circumstance you are familiar with it because you are living in it right now. 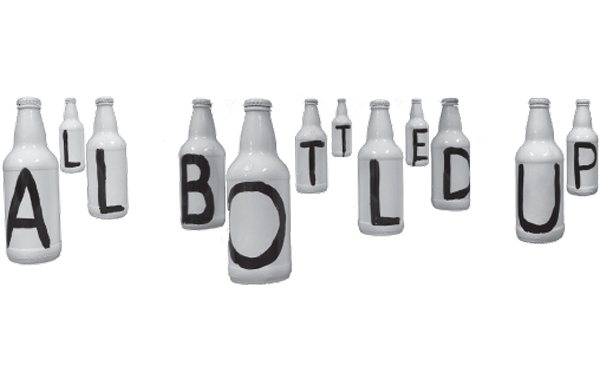 What is bottled up inside of you? Notice with me that when Zechariah’s tongue was loosened he didn’t start screaming about the nine months he was made silent. No, no my friends he broke forth in bottled up praise and cried out “Blessed be the Lord.” He didn’t let nine months of silence inhibit his praise. He got his praise on! He didn’t let nine months of waiting make him bitter it made him better. He couldn’t see John with his own eyes. He saw his answer to prayer growing for nine months. He felt him kicking inside his mother’s womb. And then finally he saw the answer to his prayer born. What are you waiting for? When it arrives are you going to break forth in radical praise or are you going to break forth into a bitter dirge? Are you going to sing a new song or the blues? We have a choice. What is getting bottled inside of you today? My prayer is that it is praise and adoration. My prayer is that you will see the grace of God in your life. My prayer is that we won’t say, “Look what God has done TO me.” rather we will say, “Look what God has done FOR me.” Be encouraged!